Patients who have never had low back pain (primary intervention). Back school, as a means of secondary prevention, are indicated for patients who have to contend with acute, chronic low back pain or with recurrence a-specific low back pain (but also post-operative patients or patients with a disc prothesis). Back school is aimed at people with low back pain that can be linked to the clinically relevant anatomy. Functional load / compression on the nucleus pulposus results in a deformation without changing the volume of the nucleus. When a persistent compression is applied to the anulus fibrosus, it will release water. The height of the disc decreases, so there is more compression on the nucleus pulposus. The disc needs compression to maintain the metabolic activity of the disc, osmotic system of the disc Lumbosacral Biomechanics. But when the compression is too high, the intradiscular pressure increases and can develop in low back pain. Some body postures and movements increase this intradiscal pressure. The purpose of back school is to teach how these movements and postures can be avoided and to avoid this increasing intradiscal pressure. 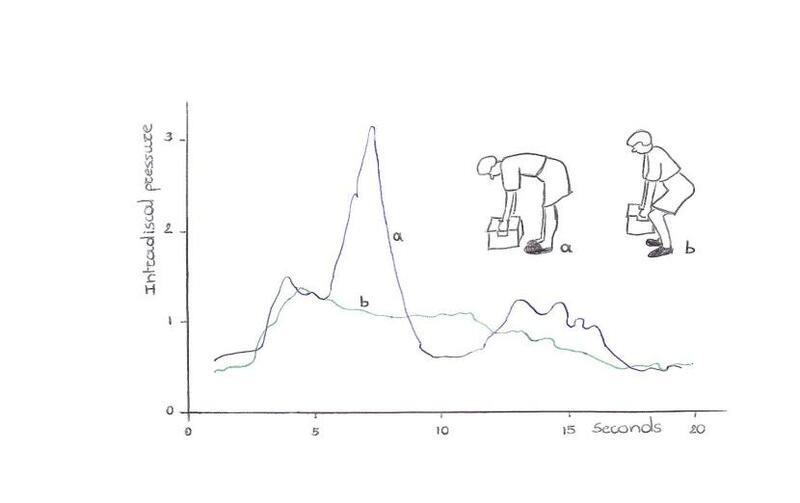 For example, the intradiscal pressure by lifting a box. On the graph you can see the intradiscal pressure by two types of lifting. It’s by the principal of the lever. As the load and load arm are smaller, the force required to keep the lever in balance is smaller too. Fig. 1: When you lift a box with a rounded back, the intradiscal pressure increases with a sharp peak. It's better you lift a box with a straight back. Information about the anatomy and function of the spine, spinal biomechanics, physiopathology of frequent back disorders, epidemiology… Nowadays, this part of back school (giving information) is limited as compared to the back school in 1969 . - Sedentary work as a banker. A banker sits the whole day, so it’s important he’s sitting in a correct way: When he bends forward while sitting, the intradiscal pressure is supposed to be twice as high as while standing. 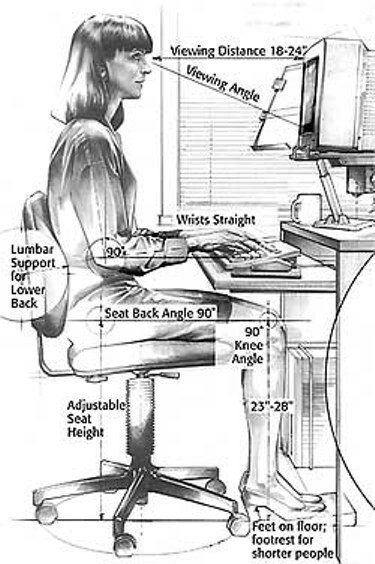 The correct way of sitting: both feet supported on the ground, situated below the knees at waist level. The waist is situated a little higher than the knees and leaning with a straight back against the backrest. It’s also important his worksheet is situated at a correct height. Active protection of the spine by active exercises, for example some exercises: - Flank breathing versus diaphragmatic breathing: The pressure-changes in the abdomen resulting from diaphragmatic breathing causes some instability in the low back. Flank breathing maintains the tension in the abdominal muscles. (So there is no instability in the lower back). Moderate evidence = Provided by findings in multiple low quality RCT’s (level of evidence 2B) or findings in one high quality RCT (level of evidence 1B) plus one or more low quality RCT’s.